When we learned about Sassy's retirement we knew we needed a very special place for the party! Don't you think Versailles is perfect? So we rented it for the whole day to give Sassy her party there! 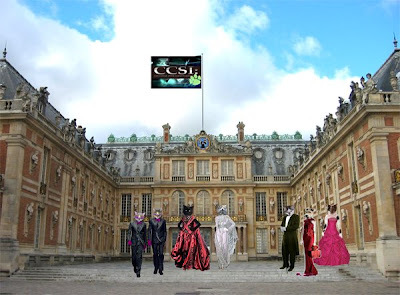 The CCSI flag is flying above the castle, and the CCSI emblem is on the roof. Everything is decorated in the honor of Sassy. Here is the food and beverage room, in the "hall of fame", hahahahahahahahahahha. Feel free to eat and drink as much as you can, we have unlimited supplies! 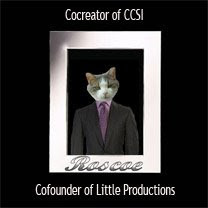 Then, in the Hall of Mirrors, we give Sassy a "Lifetime Achievement Award" in honor of her contributions towards CCSI. 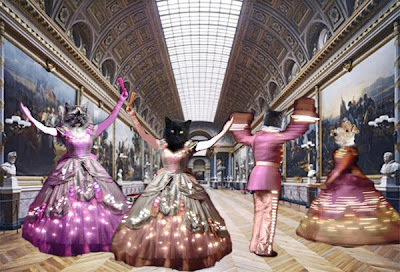 And then the dance floor is open, Momo, Sassy, Opus and Asta brought glow in the dark authentic dance costumes - so join in the fun and let's party! 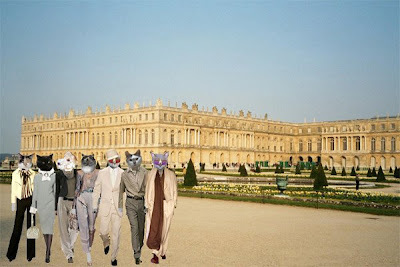 But we can see you and your friends had a wonderful Pawty at Versaille!!!!! we would love were with you there...seems all of you had tons of fun!!! And what a wonderful dresses....MAya is dreaming to wear one of them!!! Mmmmmmmmmmmm....but we must be honest....we dream one of those costume too!!!!! Thanks for sharing such a great pics of your day!!! Enjoy your day sweet friends!!!! Tons of love and kisses and licks from PAco,Milo & Maya!!! Oh, what a perfect setting for Sassy's retirement part. She deserves the Lifetime Achievement Award. We're all a little teary, already missing Sassy. But you said there's unlimited food and drink? Hey, Buddy & Sam, don't run, the food will still be there if you walk. This is a fancy party. Have manners. Just when I think you all cannot out due yourselves you prove me wrong. To have a party at Versailes, you had to rent it our for our private party! 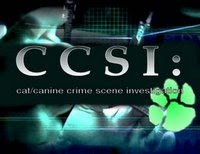 Then to be presented with a Lifetime Achievement award in honor of my contributions towards CCSI I can say you almost have me speechless. I must run now as there is more dancing to be done. (Socks) MoMo I am having a wonderful time dancing with you. Let's take a break and rest for awhile. (Scylla) Brain and his sisters should be here soon. I want Brian to dance with me. (Charybdis & Fenris) This food is yummy to our tummies. Greeting everyone, now if you will excuse me I am promised a dance with Scylla, ready my dear??? What a wonderful party...what a sad reason for having one...we sure are going to miss Sassy. We hope she has many lovely adventures in her retirement...and comes back to us eventually. I am dizzy fwom all that twiwling! 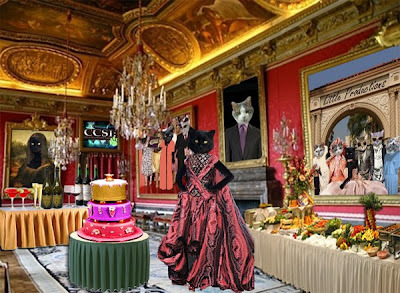 Isn't it fun to be all dwessed up , dancing eating, umm I'm soo thiwsty fwom all this dancing..would you come out on the balcony fow a wefweshing glass of champews wif me? (Scylla) Brian I am having a ball dancing with you (pun intended). (Socks) MoMo would you care for some of that yummy desert I see? I will be happy to fetch some for you. (Fenris & Charybdis) Let's play thundering herds of elephants!!!!!! What a beautiful party! You guys really outdid yourself this time! My dearest friend Sassy! I must tell you what an honor it was to work with you in The Missing Mummy Caper where I played Peach Pitt. That was a thrilling event for me. Now I read of your retirement and see how well loved and missed you are going to be by all of us...I wish you a world of happiness wherever it might lead you. Know that you will never be forgotten! What a party!!! Very fitting for our party girl Sassy. I wonder what tomorrow - our final day will bring. Surely nothing can top this ball??? Boy, howdy! 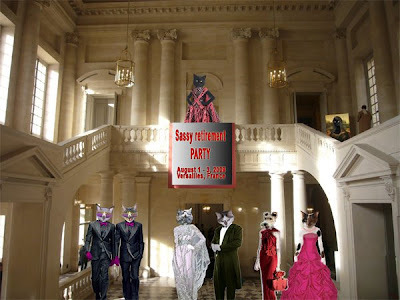 You kitties really know how to throw a party! This is so much fun. Sassy really deserves the Lifetime Achievement Award. Now for some food and drink and to watch the dancers. Those dresses are really something to see. What a party! Love your dresses ...even more beautiful than the palace!! The photo's are really really beautiful, you deserve an award for those. Then the dreamy dancing.. anyone fancy a foxy trot with me? He,heeee!!! Cheers kitties, bottoms up! 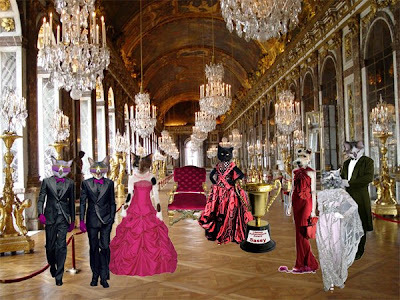 What a purrfect venue and purrfect party. All of the pictures are stunning. Your photographer did an amazing job. You'll have these memories always. Thanks for letting a few wireys attend. We loved it. This was the most beautiful, impressing party I've ever attend to! 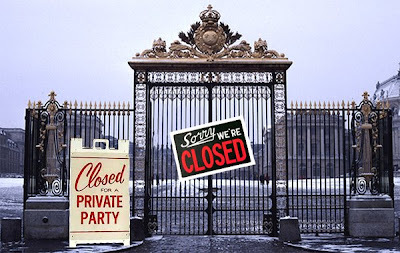 To eat, drink, dance and party in the palace of Versailles..., it was almost a dream! And seeing Sassy receiving the award she so much deserves was such a beautiful moment.